This is my NFP- new favourite picture. For now. 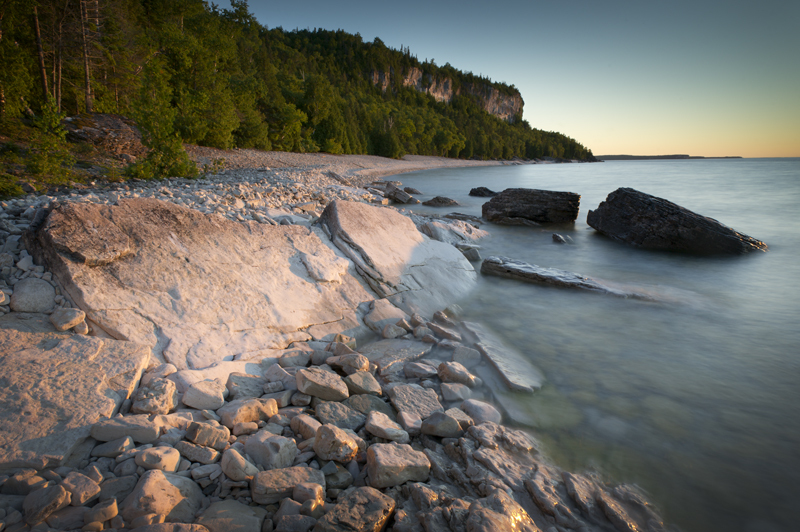 I got away for a few days to the Bruce Peninsula, to be quiet and of course, take some photos. It is a magical place, just a few hours away from home, yet exotic and very different from the landscape of southern Ontario. But it has been difficult to come up with a photo that seems to go beyond the surface of the place- however beautiful it is- and express what the area feels like to me. But this time it all fell into place with reasonable effort. Before too long I saw in my mind’s eye a mood, a composition and qualities that turned into an inevitable image. That process I can’t explain, but I love it when it happens to me, or when I see or hear the products of other people’s creativity. And those moments feed my creative appetite regardless of what I am photographing, and the images seem to inherently matter to me. Photographs are being taken and “shared” in astronomical numbers, but how many of them truly matter? What is an image that matters?? A photographer friend of mine and I had a beverage while discussing that concept recently. More discussion (and beverages) is required of course, but for me, an image is significant when it simply gets your attention. Simple, but not simple. It makes you think, feel and dream. It somehow affirms life and makes you conscious of the moment, and has you re-evaluating your values, and seems to give you a better capacity to do that, somehow. This outing was a few days well spent. And lastly, the people you meet at back country campgrounds, and in parking lots from where you start and finish, are great. They seem to be more alive, asking and thinking about what matters. They’re not just shopping.